Madewell is a women’s clothing and accessory retailed introduced by the larger J.Crew Group, Inc. in 2006. With over 65 locations across the United States, the stores are a modern-day interpretation of the traditional American jean label. Madewell offers consumers a variety of products, including clothing, accessories, shoes, and swimwear. With Big Apple Buddy’s personal shopping service, you can now buy direct from the USA Madewell online store anytime, anywhere. The Madewell Online Store houses products from famous brands like Puma, Birkenstock, and Hunter in addition to pieces from their own special Madewell line. Shop for the perfect summer look at Madewell, with items such as the eyelet bistro romper, which will help you stay stylish and cool this season. For those who value the importance of accessorizing, Madewell offers bracelets, necklaces, and other pieces of jewelry from high-end designers like Pamela Love and Crescioni. 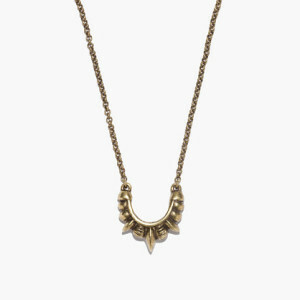 The Small Tribal Necklace from Pamela Love, a New York City designer, was made exclusively for Madewell. Unfortunately, the Madewell online store only ships to select countries. However, Big Apple Buddy, your personal shopper, can help you buy products direct from the official Madewell online store and ship them to your doorstep, no matter where you are in the world. If you would like to buy from the USA Madewell online store, simply let us know which items you would like to order (by filling out the form below). We’ll get back to you with a free international shipping quote within 24 hours!